This short, boy cut is long on style and fullness. Beautifully tapered lengths throughout offer a multitude of styling options from full and soft to textured and piece-y. The slightly angled fringe can be worn onto the face or swept away while the razor cut nape creates a soft clean look in the back. 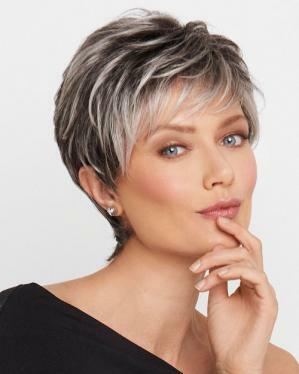 The Sheer Indulgence temple-to-temple lace front monofilament top allows for natural looking off-the-face styling and parting options.